Lemkim Koi, a Chinese boy punished by the Japanese for supplying POWs with food, seen here with Cpl. C.E. Bullen, Pte. F. Cantell, Cpl. S.E. Michell, L/Bdr. D. Carmody, Driv. W.C. Pascoe, 1945. Image courtesy of Argus Newspaper Collection of Photographs, State Library of Victoria. 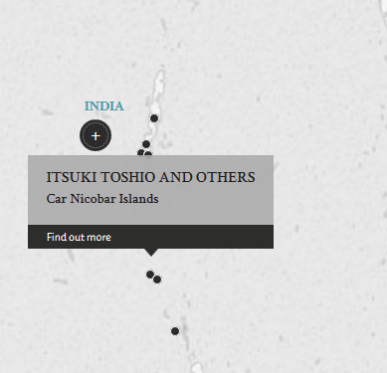 In July and August 1945, all accused persons were members of the Japanese occupation forces on Car Nicobar island. Major-General Itsuki was the General Officer in Command and Captain Ueda was the Chairman of the Committee for Civil Administration. Since March 1944, there had been Allied attacks on the island by air and sea. In July 1945, the Japanese expected an invasion by British forces. In April 1945, after an Allied attack, the Japanese alleged that there were signal flares coming from the island, and suspected the local inhabitants of spying and communicating with the Allied forces via signal flares. On 5 July 1945, Taruka, a native, was arrested for stealing rice. In the midst of investigation, Captain Muneyuki discovered an oil lamp with a cover made from a piece of shirt near Taruka's house. Thinking that it was a signalling lamp, Captain Muneyuki reported the matter to the Japanese Army HQ. Under torture, Taruka revealed the names of natives who were allegedly involved in signalling to the Allies. 56 individuals were arrested as spies, and confessions extracted by means of interrogation, torture (including burning and water treatment) and beatings. 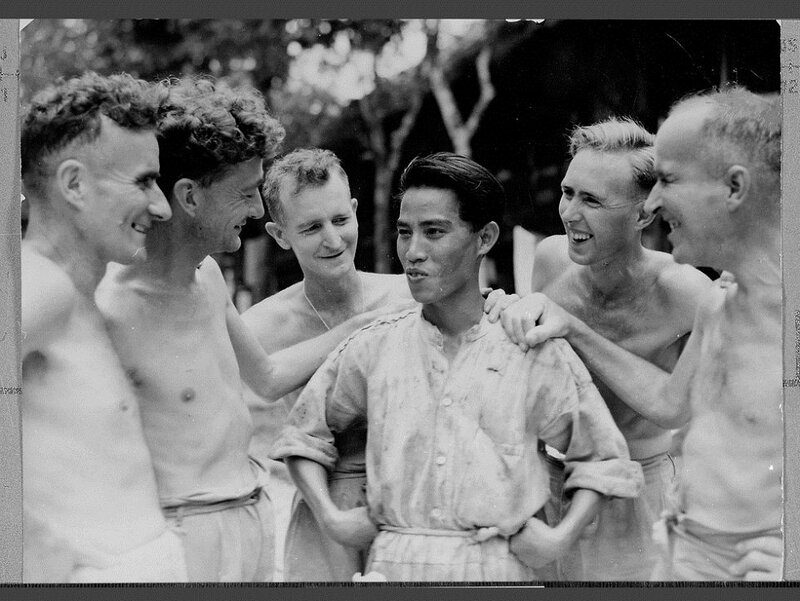 Of these 56, 4 were released, 4 died and the rest committed for trial by the Japanese. Captain Ueda requested for a judicial officer to be sent to the island to try the civilians but the request was refused. Major-General Itsuki organized the trial and presided as the Court Martial, which consisted of reading the cofessions and recording the pleas of "guilty". The 48 civilians were sentenced to death and shot the very same day. 2 further trials were carried out. On 7 August 1945, 22 civilians were sentenced to death by shooting and on 13 August 1945, 11 more were executed. The prosecution's case was that the Japanese could not accept the fact that they had suffered at least 4 accurate bombings by British forces, and many of their installations and HQs were hit very accurately. It was felt that the British, as the inferior race to the Japanese, could not have managed this without aid. The prosecution therefore argued that the Nicobarese were made the scapegoat. Itsuki, Toshio. Major General. From Japanese military. From Japan. Guilty. Death by shooting. Sentence confirmed. Ogura, Kenji. Paymaster Lieutenant Commander. From Japanese military. From Japan. Guilty. 12 years' imprisonment. Sentence confirmed. Ueda, Mitsuharu. Captain. From Japanese military. From Japan. Guilty. 15 years' imprisonment. Sentence confirmed. Sakagami, Shigeo. Lieutenant Colonel. From Japanese military. From Japan. Guilty. 3 years' imprisonment. Sentence confirmed. Saito, Kaigo. Captain. From Japanese military. From Japan. Not Guilty. Sumi, Toyosaburo. Captain. From Japanese military. From Japan. Guilty. 10 years' imprisonment. Sentence confirmed. Muneyuki, Yasuo. Captain. From Japanese military. From Japan. Guilty. 12 years' imprisonment. Sentence confirmed. Kita, Tomio. Warrant Officer. From Japanese military. From Japan. Guilty. Death by hanging. Sentence confirmed. Arai, Mitsui. 1st Class Petty Officer. From Japanese military. From Japan. Guilty. 10 years' imprisonment. Sentence confirmed. Matsuoka, Hachirochon. Sergeant Major. From Japanese military. From Japan. Guilty. Death by hanging. Sentence confirmed. Torii, Kazuo. Lance Corporal. From Japanese military. From Japan. Guilty. 10 years' imprisonment. Sentence confirmed. Nakazawa, Tawakichi. Corporal. From Japanese military. From Japan. Guilty. 10 years' imprisonment. Sentence confirmed. Kimura, Hisao. Superior Private. From Japanese military. From Japan. Guilty. Death by hanging. Sentence confirmed. Ono, Minoru. Superior Private. From Japanese military. From Japan. Guilty. 10 years' imprisonment. Sentence confirmed. Uchida, Masahiro. Interpreter. From Japan. Guilty. Death by hanging. Sentence confirmed. Yasuda, Muncharu. Interpreter. From Japan. Guilty. Death by hanging. Sentence confirmed. Stevens, L.B. Captain. From British military. Law student. Nakazono. Judge of the Japanese High Court (Criminal). Toda. Judge of the Japanese High Court (Criminal).